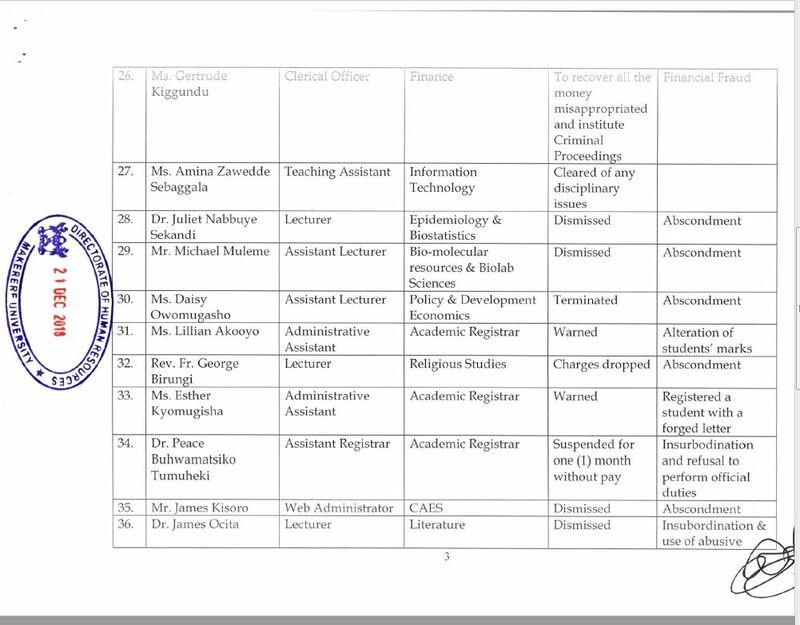 MAKERERE – It’s not every day that a university fires nearly 50 academic staff. But that’s what has just happened at Uganda’s oldest institution of learning, Makerere University. 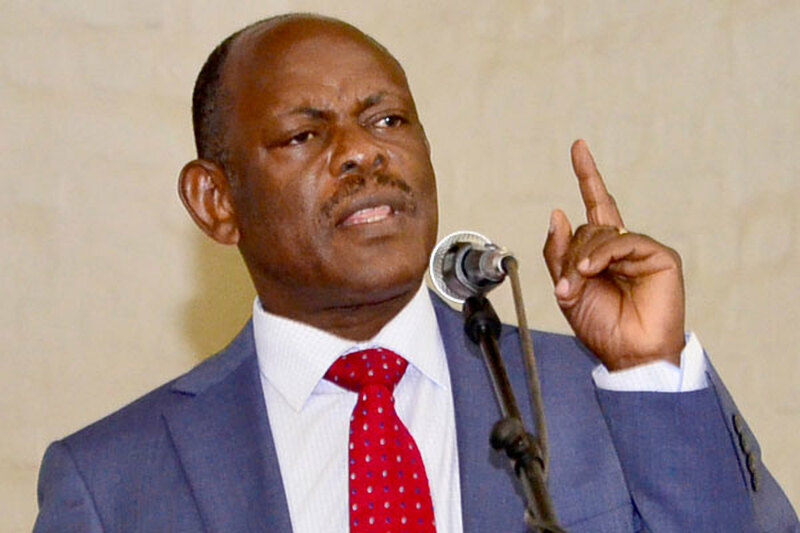 The university has announced it has sacked 45 senior academic staff, in a statement by the University Human Resources Director, Andrew Abunyang. PML Daily has learnt the decision was reached at following five consecutive meetings by the University Appointments Board chaired by Bruce Balaba Kabaasa held between November and December this year. Following the lengthy meetings, the board also decided not to renew the contracts of some of the staff and also sacked many for Unauthorised absenteeism. Dr. Stella Nyanzi, the embattled research fellow at Makerere Institute of Social Research (MISR) is one of those whose contract hasn’t been renewed. Those sacked for abscondement include Dr. Haroon Sseguya, a senior lecturer in the department of Agricultural Extension and Innovation, Grace Nabulo, an Assistant Lecturer in Botany, Dr. Irene Bet Kizza a senior Nursing lecturer from School of Medicine, Dorothy Kwagala, an Assistant Lecturer from School of Law, Aggrey Mwesigye, a Mechanical Engineering lecturer, Sarah Alobo from Agribusiness and Natural Resource Economics department, Dr. Silas Oluka, a senior lecturer of Science and Technical Education and Dr. Gilbert Wathum from Forestry; Biodiversity and Tourism department. Others are Olive Darlia Buhule, an assistant lecturer in the department of Statistics & Actuarial Sciences, Stella Maris Sendagi from Agricultural & Bio systems Engineering, Harriet Namukwaya Kabunga from European & Oriental Languages department, Dr. Catherine Namono from Painting and Art History department and James Semuwemba, an assistant lecturer from Civil & Environmental Engineering, Joseph Derrick Olaka, a Teaching Assistant of Computer Science, Jude Olinga, a teaching assistant of Epidemiology & Biostatistics and Ms Eiman Elwidaa, an assistant lecturer of Architecture & Physical Planning. Others are Saad Fatihia Migdad a deputy registrar, Stephen Tumutegyereize, a lecturer in Planning & Applied Statistics department, Achilles Lawrence Nyanzi, a teacher of Foundation & Curriculum Studies, Geoffrey B. Tukahebwa, a lecturer of political science and Denis Asiimwe, an assistant lecturer at Human Rights and Peace Centre – HURIPEC. lgeme Katagwa from Sociology & Anthropology department, has been warned for failure to complete studies on time while John Mushomi Atwebembeire, an Assistant Lecturer of Population Studies has been suspended for four (4) years without pay over assault. 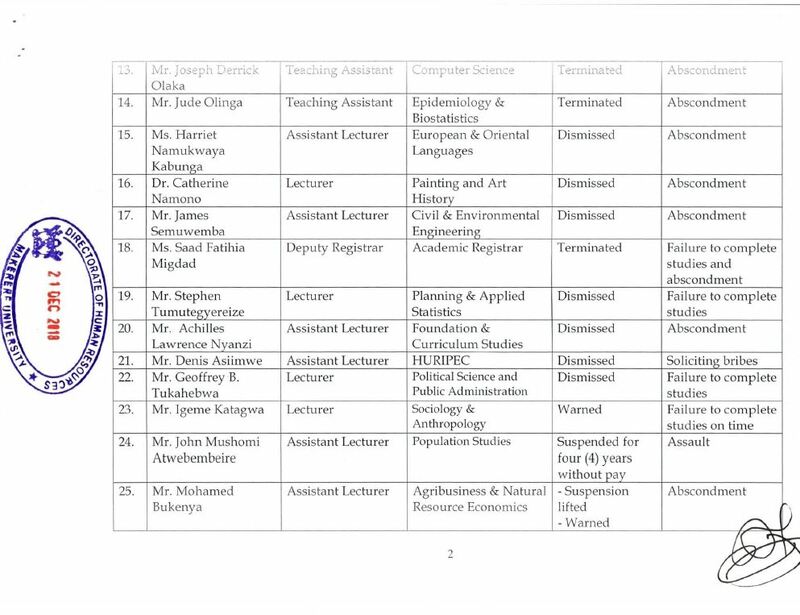 Mohamed Bukenya, an assistant lecturer of Agribusiness & Natural Resource Economics who was previously suspended for abscondment has been reinstated with warning. Dr. Elly Amani Gamukama, a senior University Librarian who is charged with abscondment and failure to complete studies in time has been ordered to refund all money received after the expiry of his study leave. Godber Wilson Tumushabe, an assistant lecturer at the School of Law has been cautioned for abscondment and reinstated at the school of law. The board has directed Gertrude Kiggundu, a clerical officer in the finance department who is accused of financial fraud to refund all the money misappropriated and that Criminal Proceedings be instituted against her. Dr. James Ocita, a senior Literature scholar and former research fellow at MISR has been dismissed for insubordination & use of abusive. Dr. Ocita has been a vocal critic of Maladministration at MISR and Prof. Nawangwe’s Administration. Perez Arinaitwe, an accountant was dismissed for insubordination and refusal to perform official duties, while James Kisoro, a Web Administrator in the College of Agriculture and Environmental Studies – CAES was dismissed for abscondment. Meanwhile, Richard Mayanja, an assistant lecturer of Computer Sciences was dismissed for failure to complete studies and Dr. Juma Okuku, a senior Lecturer in Political Science and Public Administration department has been dismissed over incompetence & inefficiency. 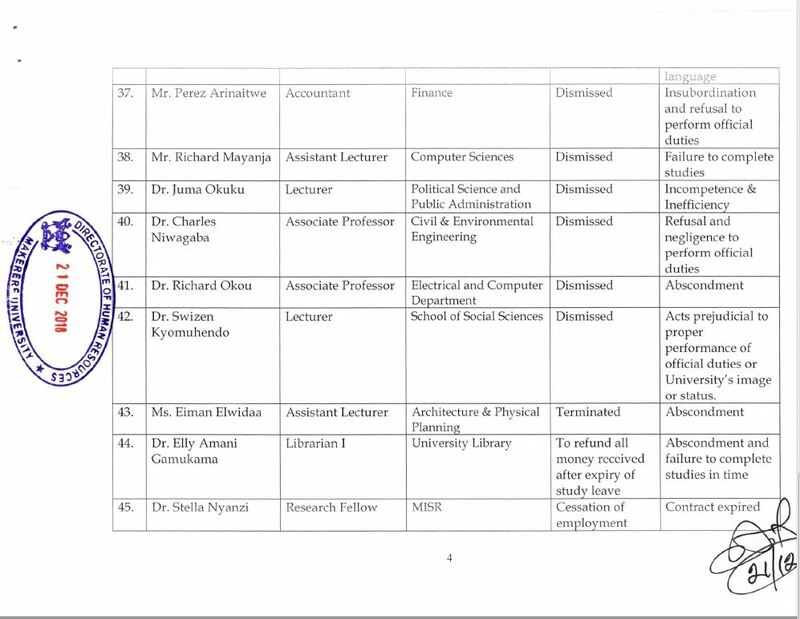 Dr. Charles Niwagaba, an associate Professor in Civil & Environmental Engineering department was dismissed for refusal and negligence to perform official duties while Dr. Richard Okou, an Associate Professor in Electrical and Computer Department has been dismissed for abscondment. Dr. Swizen Kyomuhendo, a Lecturer in School of Social Sciences has been dismissed over acts prejudicial to proper performance of official duties or University’s image or status. Dr. Juliet Nabbuye Sekandi, a Lecturer in Epidemiology & Biostatistics and Michael Muleme, an assistant lecturer in Bio-molecular resources & Biolab Sciences were dismissed for abscondment while Daisy Owomugasho, an assistant Lecturer of Policy & Development Economics had her contract terminated for abscondment. In the Academic Registrar’s unit, Lillian Akooyo, an administrative Assistant has been warned against alteration of students’ marks, Esther Kyomugisha, also an Administrative Assistant received a warning after she registered a student with a forged letter. Dr. Peace Buhwamatsiko Tumuheki, an Assistant Registrar has been suspended for one (1) month without pay for insubordination and refusal to perform official duties. Rev. Fr. George Birungi, a Lecturer for Religious Studies formerly charged with abscondment had his charges dropped while Amina Zawedde Sebaggala, a Teaching Assistant of Information Technology was cleared of any disciplinary issues. 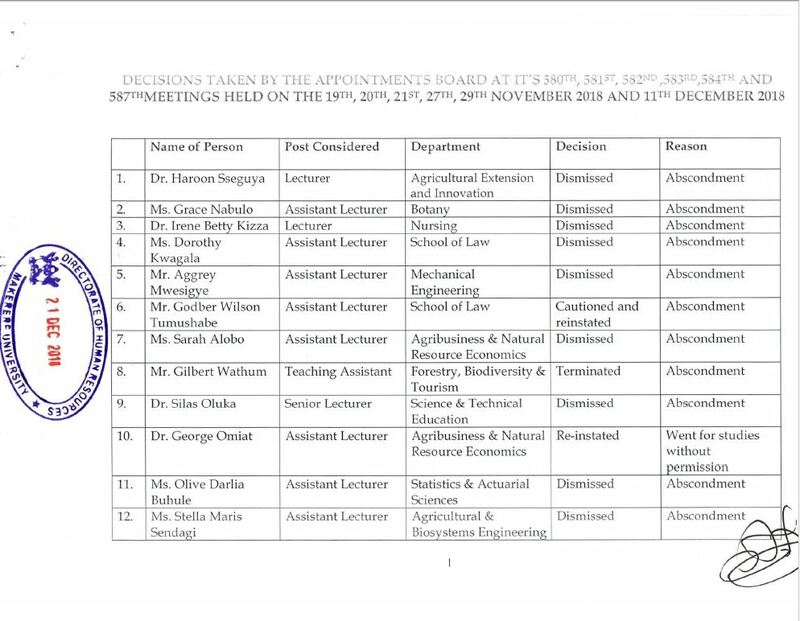 The Board also reinstated Dr. George Omiat, from Agribusiness & Natural Resource Economics department who apparently went for studies without permission.